I still remember the moment it was somewhere around the third week of June 2017 when I came to know that I had secured myself a seat at IIM Amritsar. People around me were extremely euphoric maybe because it was the first time that I had achieved something of this magnitude in my career. As far as I was concerned there was a feeling of immense self-satisfaction on one side that I am one of the select few to bag an IIM seat but an inherent fear on the other side as I had read stories about the picture not being that rosy in the so-called third generation IIMs. An irony isn’t it? So then came the pleasant reality check on the day I visited the hostel, a truly amazing place set in the city outskirts. 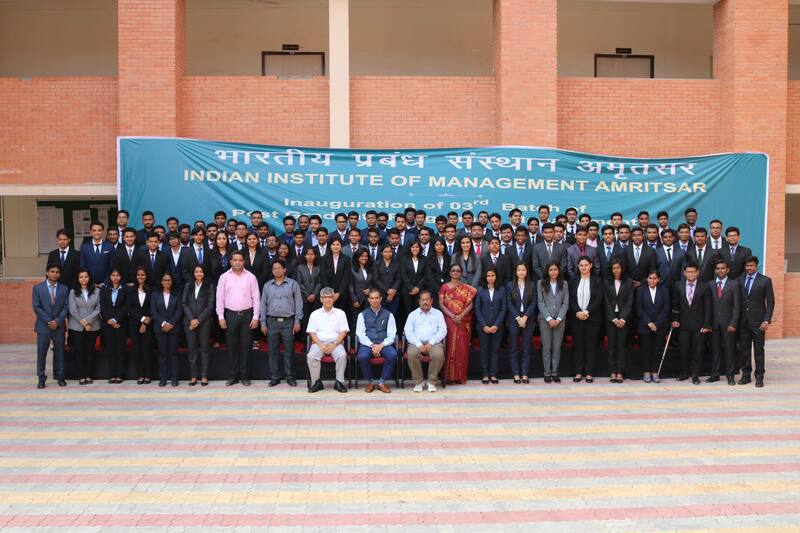 So yes, my first experience about IIM Amritsar was positive but as destiny would have it when I visited the campus, I was really amazed to see the way this Institute had developed in just two years since inception and all those fears of this being a new IIM whether it would be up to the mark slowly started getting dispelled. As they always say it is better to experience a particular thing before expressing an opinion on the same and just not blindly go by hearsays. Then came the first day of the lectures, I somehow convinced myself to be enthusiastic for the same and there came Prof. Shovan Chowdhary, a teacher beyond excellence, someone who taught the subject I hated, in an amazing manner. So finally, I was convinced that IIM Amritsar actually had the mettle as far as the teaching pedagogy and the faculty were concerned. One relieved man I was. I came to my room that day in the evening only to find out that I had to share my room with a weird guy from down south. Roller-coaster of emotions isn’t it? But it had to be I guess as a whole new experience was unfolding for me out here at IIM Amritsar. The first week went by I developed a good rapport with my seniors and slowly I got a feeling that I belong out here. I guess the taste of Punjab can’t be left out while I am writing this article. Amazing food something which I always crave for warm hospitality wherever we go not to forget the frequent visits to the iconic Golden Temple and Jallianwala Bagh and plus a whole lot of other things which Punjab is infamously famous for, all these became a part of the daily routine. Like in every business school time for earning some bragging rights come in the form of Committee elections. I stood up for the MPRC and landed up winning the elections. So, there I was bestowed with the tag of being a Committee member only to realize soon that being in a committee also throws up a lot of responsibilities. I had one of the best times of my life being in the MPRC, the support that I got from my seniors was impeccable. The Committee mentor Mukesh Sir has been an amazing inspiration. Being an avid photographer, I covered various events that took place in the college, the quintessential conclaves, the guest lectures, the committee and club activities. At the same time, I ensured that I gave equal importance to academics and extra-curricular activities too. I participated in various business school competitions something which is a must for every IIMite if I may use that terminology. Being a sports enthusiast, I used to love to play pretty much every sport ranging from cricket to football, badminton, and even volleyball not to forget the indoor games. I guess that’s the beauty of IIM Amritsar, it has a lot to offer in every sphere. So many things happening daily, flagship event like Yukti- The HR Conclave, Pariprekshya – The Finance and Marketing Conclave, Sankshetra – The Operations Conclave, Kritansh – the Annual sports fest, the Independence Day marathon, Aarunya – the annual management, cultural and sports fest, the Cultural Committee celebrating all festivals be it Eid to Onam To Diwali and this list is endless. At any point in time being in the hostel or in the college, one sees students attempting to solve tough corporate case studies, playing virtual stock market games. There are then those academic toppers a set of people whom I am seriously allergic to, who attend every lecture and try to score those pointers and thus making life difficult for easy going people like me. I know I may be repeating the same point but this Institute has plenty to offer. In spite of being in the fourth year only, it has made commendable improvements in terms of building a best-in-class infrastructure with some outstanding faculties both in-house and visiting and some down-to-earth humble office staff. Coming to the most important part, the set of friends that I have made out here, some of whom I wish to be in touch with throughout my life. I have my core inner circle with whom I pretty much share every moment in this Institute. I still remember the trip to Manali and Dalhousie with them – truly unforgettable memories. We study together, play together, hang out together and we have started investing together Yes investing (I have this flatmate of mine who is a Chartered Accountant and happens to be one of those academic geeks and he inspired us to start investing). As I now near the twilight of my two years at IIM Amritsar, I would say that I am blessed to have been part of such an Institute, I also feel proud of the fact that I have been able to involve in a lot of Institute building activities and I am also proud of the way my career has been shaping up. I believe sincerely that the key ingredient that makes the environment in IIM AMRITSAR so livelily for me is my hunger for self-improvement other catalysts like professors, fellow mates provide huge exposure to multiple dimension of management studies. I will carry a lot of memories with myself some of which I have discussed out here, lots of friends – a select few special ones too. I know its five more months to go but the nostalgia is setting in me already. From the clueless person that landed in Amritsar to a person who is now confident of pursuing a decent career in marketing (Ah Yes! I forgot to tell you all that I am specializing in Marketing after all), I feel IIM Amritsar has helped me to pin down a new page in my career. The farewell would be an emotional moment for sure – a sense of let go though would have to set in as they say in life that all good things have to come to an end. So, the last few days at MPRC, last few days of those late-night enjoyments, last few days for those Aloo Parathas and Chole Bhatures, last few days of lectures beckon me as I write this article. I guess now is the time to re-live everything that I have experienced before we all get occupied in our professional careers. Cheers to this last phase. Hope it will be an exciting one!!!!! !